At another show, I met fellow appliqué enthusiast Louisa Postier, who showed me the sweetest little wall quilt that she made using one of my blocks. Louisa added heart-shaped buttons to the stems! Adorable! They look like hearts that are just about to bloom. And the border fabric is perfect. 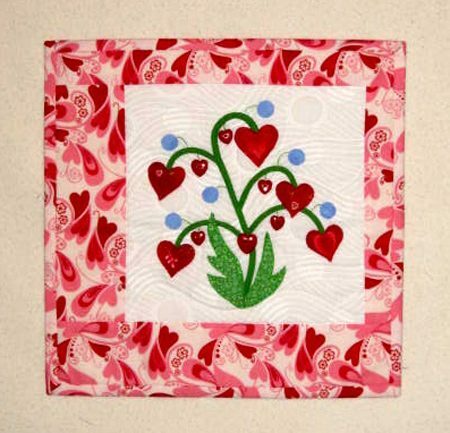 Heartberries is one of the designs in my book Growing Hearts to Appliqué. Thank you, Maryann and Louisa, for taking the trouble to stop by and show me your projects. 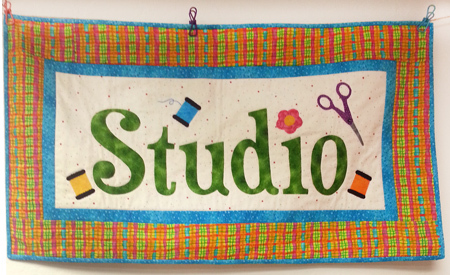 I love seeing what other quilters do with my designs. P.S. Another personal Show & Tell: my little teddy bear dog. What breed is your darling little dog? My “Daisy” looks just like that but when we adopted her from the shelter, no one knew what she is. I can tell you that she is faster than lightning and loves everyone she sees. Thank you for the “studio” idea !!! Very nice show & tell. 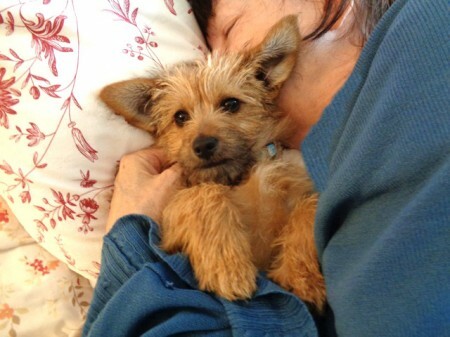 Is your little Teddy Bear dog a Carin Terrier? He/She sure is cute! My little Dixie looked just like her when she was small!